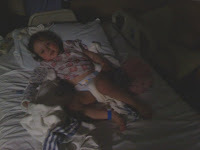 Because of Ava's age we were admitted straight to ICU. It is a scary place to be but once again Ava was able to be the shining light(people came by our room just to see her smile!). We were all terrified, my son was left at my in laws. Our new puppy was home alone and we had no clue about diabetes. So here we are not knowing anything not even what to ask while our daughter is being hooked up to all sorts of tubes and monitors and still NO FOOD. They told us if her BS(blood sugar) is lowered to quickly it can cause brain hemorrhaging! Scary. Luckily she hadn't eaten and when they were about to start the insulin drip her BS level's had already started to drop. So she was given an unknown (to us) amount of insulin and monitored all night long. Andy(the hubby) and I had very little sleep we cried a lot and grieved the loss of our daughters "normal" life. We still had no answers and were told we could be in the hospital for about a week! Ava reacted great to the insulin shots and was fed breakfast the next morning and later that day we were moved up to the pediatric floor. We got to see Logan(our son) that afternoon and he seemed to be ok with all that was happening at this point. We spent all of Memorial weekend in a small hospital room learning the basic care of our daughter, diet, blood monitoring and insulin. We were told we wouldn't leave till all our questions were answered and we were able to care for her at all times. Andy and I picked it all up quickly (we were terrified, but had to do it for Ava) there were a lot of ups and downs as there always is with a newly diagnosed child and for Ava to be so young is considered fairly rare. By Sunday afternoon were were ready to go home after a hefty bill at the pharmacy we had more diabetic supplies then we could have ever imagined and some (emergency insulin) we will hopefully NEVER have to use.